First, robots revolutionized the automobile industry – now it‘s time for the polyurethane industry. At the Interzum trade show, Bäumer introduced an absolute first for the industry with the B-BOT. B-BOT is an industrial robot used as a handling system in a foam cutting system. 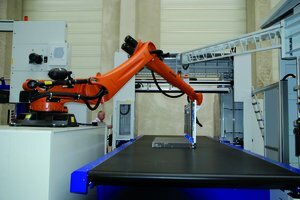 The robot stands between two contour cutting machines arranged in parallel, grips and transports foam sheets, waste strips or cut-offs. Controls of the robot and the vertical and horizontal CNC cutting machine are interconnected, enabling a fully automatic process. The B-BOT uses a needle gripper system as its tool in this case. The special feature of the robot is that it can be installed individually and universally, making numerous functions possible. 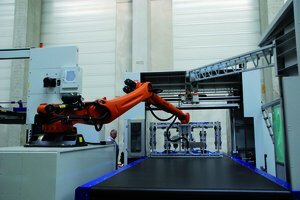 Both the robot‘s tool and programming can be specially adapted by Bäumer for the specific application and combination with various cutting machines. – Sheets are cut from a single block on the horizontal contour cutting machine OFS-H Twincut. B-BOT picks up the sheets individually and lays them, pearfectly aligned, on the vertical contour cutting machine OFS-VS. In the multi-sheet mode, it stacks the sheets with precisely aligned edges. – The sheets are trimmed on the OFS-VS. B-BOT grips the waste strips and disposes of them. – A contour program is cut on the OFS-VS and unloaded by the B-BOT. In comparison to conventional handling systems, the robot offers many advantages. – The edges of the stacked sheets are perfectly aligned, so vertical contour cuts produce little waste. – B-BOT replaces a height-adjustable conveyor belt since it can remove individual sheets from the block. – With machines aligned in parallel, B-BOT replaces the shuttle for transporting sheets. 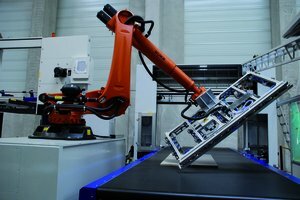 – B-BOT removes the waste strips or sheets produced during trimming on the OFS-VS, without altering the position of the material being cut. So far, this application is only possible with the B-BOT and, until now, had to be carried out manually by additional operating personnel. – The required space is very small and the equipment is therefore suitable for production areas with limited space. – Installation of a quick change system for different grip and vacuum tools is also possible. – Despite its versatility, this system requires little maintenance compared to mechanically complex handling systems. The Albrecht Bäumer GmbH & Co. KG has been a leading manufacturer of machines and plants for the foaming industry for more than 60 years. The main focus of the company is on special machinery for the cutting, converting and transport of polyurethane foams and similar materials. We, as a medium-sized company, have been able to evolve from a pioneer to the world market leader in this field.